BizInt Smart Charts for Patents builds charts from search results on the new STN platform using the BizInt Smart Charts (.bpd) export format. Support for Hit Structures on New STN was introduced in Version 4.5 (Oct 2017). Instructions on saving search results containing hit structures are available. Version 4.2 (Feb 2016) supports platform changes in the new STN export for CAplus patent families and DWPI records. We strongly suggest all users working with new STN upgrade to version 4.2. Trial software supporting new STN can be downloaded here. Perform your search on the new STN platform and select the records to be exported. From the Results panel, click on the Export icon. (c) choose the BizInt Smart Charts (.bpd) export format. When the .bpd file finishes exporting, you may either save the file and import it into BizInt Smart Charts for Patents, or simply Open the file. Note: Exports on the new STN platform are limited to 500 records. If your query returns more than 500 results, you can select and export blocks of up to 500 records and then combine the sets into one report in BizInt Smart Charts for Patents. If you search multiple files, you can export one or more files at a time. 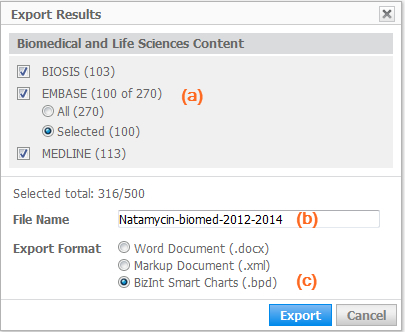 The total number of results in each export file is limited to 500. CAplus - Bibliographic and patent information only. GI structure images supported. (see also Notes 1, 3) Hit Index Terms and Hit Structures supported in Version 4.5 (Oct 2017). Version 4.2 (26 Feb 2016) required for abstract structures and to solve a problem with missing family data for some records. DWPI - Including subscriber content, claims from selected member. We strongly suggest using the FULL or INVENTION exports only. (see Notes 1, 2, 3) Version 4.1.2 (23 Nov 2016) supports changes to the structure of the DWPI data, including a problem with missing Patent Assignee data. (1) SUBJECT_INDEXING is not extracted in this build. (2) Most of the fulltext files may contain more than one publication per record. When more than one publication is present in a record, we attempt to select the information from the "most relevant" publication. (3) We are displaying the original classification in most cases (e.g. IPCI rather than IPCR). Full details of IPC and CPC are not included at this time. (4) Patent records in literature databases are supported, however the Inventor will be in the Author field, and Assignee in the CS field. The following databases are not supported in this release. INPADOC - currently not exportable from the new STN. The following are databases which are more often used for searching, not reports. The results from these databases are typically crossed over to other databases for reporting purposes. REGISTRY - Beginning in Version 4.5, we construct a Hit Structure display when both CAplus and REGISTRY records are included in the export. We do not yet support REGISTRY as a stand-alone database, but intend to in a future release. MARPAT, DWPIM - We need to think about how we can present this data in a meaningful way. DCR, REAXSYSsub, REAXSYSbib - With the introduction of the Hit Structure display in Version 4.5, we now plan to add support for these databases in a coming release. For all other files, only the first image or structure for a record is displayed. Hit highlights are not preserved/displayed. Multi-byte characters are generally not supported, resulting in "garbage" in some cells. The new STN export does not include FIZ AutoDoc or ChemPort links, so no Links to Publisher Records are provided.